Makana Traffic Chief Coenraad Hanekom has advised local drivers whose licences will soon expire to renew them at least a month in advance. Hanekom spoke to Grocott’s Mail this week, as the Department of Transport struggles to catch up on a massive backlog of licence card printing. Drivers can expect to wait a number of months before receiving their new licence cards. A trade dispute between the national department and Driving Licence Card Account (DLCA) in July 2018 resulted in a severe backlog in the printing and issuing of driver’s licences. Minister of Transport Blade Nzimande said in a mid-January 2019 statement that 324 000 cards were waiting to be printed. The Department of Transport had issued a directive to provincial and municipal traffic authorities not to penalise motorists who had correctly and timeously applied for their licences to be renewed. A traffic officer checks a motorist’s driver’s license in Makhanda (Grahamstown). Hanekom said under normal circumstances, it would take between six to eight weeks to receive a new driver’s licence card; however, with the extensive delays, some cards have taken a number of months to arrive. 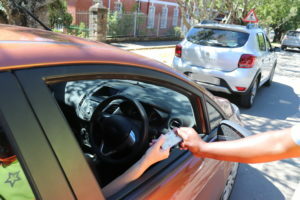 The Makana Traffic Department processes about 10 new applications a day. Hanekom said drivers whose licences are due to expire soon should renew them at least a month in advance. Doing so would give them four months of grace before their license expired completely, as drivers have up to three months after their license expires to renew it. There is some good news, however. Hanekom confirmed that currently, the other forms of licensing including license discs, vehicle numbers and traffic registration numbers, have not been affected by the backlog and should be issued within the usual period after application. Drivers can fill in the form which is downloadable on the www.aarto.gov.za. The form can be emailed to revocation@rtia.co.za for further clarity on the process. Applicants can also call the Road Traffic Infringement Agency (RTIA) call centre on 0861 227 861.